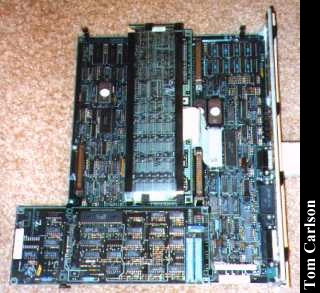 Introduced in May 1982, the DEC Rainbow attempted to bridge the gap between the Z80-based CP/M world and the 8086-based DOS world. It contained both chips and could run either operating system. I've been told that, under DOS, it used its own special graphics hardware, which left a little extra conventional memory for programs. It could also boot into a dumb terminal mode. The keyboard is way cool, with lots of special word processing keys. The amber monitor gets both its power and its video signal through a single cable. Of special note are the dual floppy drives. There is a single drive and head assembly which is shared by both drive slots. As a consequence, disks in the upper slot must be inserted upside down in relation to the lower slot. Rainbow disks had red marks which you lined up with the marks on the drive slots to ensure proper alignment. I would imagine that this set-up would also prevent you from reading from both disks at the same time. Unfortunately, it came without disks. Rainbows used their own special format, so if anyone has some Rainbow disks sitting around unused, feel free to send them to me. 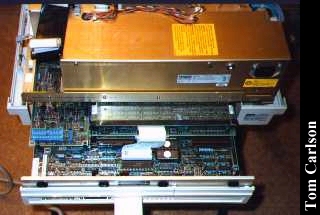 Other Z80 / 8086 hybrids include the Epson QX-16. Rainbow Motherboard - Notice the multiple daughterboards on top. Rainbow Guts - The Rainbow was very easy to take apart. Flipping two plastic switches allowed the top to just lift off. By unscrewing four thumbscrews, visible in this picture, and pulling off two cables, the motherboard simply slid out of the back of the case. The cables were labelled and even had pull loops. In this picture the motherboard is halfway out of the case. 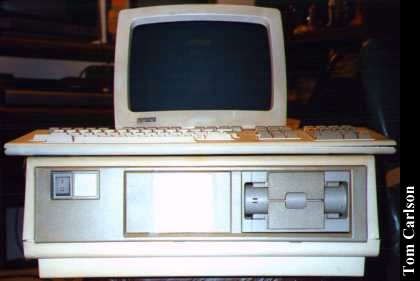 Floppy and hard drives slid in and out of the front just as easily. Click here to view all comments for the DEC Rainbow and to leave your own.